With my recent overhaul of Wizard Dojo (with a new overall look and new scoring system), I figured I’d ring in this new era of Wizard Dojo-ing with a revised version of the very first ‘top list’ I ever posted here at the Dojo; Top Video Game Launch Titles! The first time around, I listed five games, plus some runners-up. This time around, I’m upping things to a top 10! Video game consoles are defined by their best games. Sometimes, a console doesn’t have to wait very long to receive its first masterpiece, with a number of consoles getting one of their definitive games right out the gate. Although it used to be more commonplace for a console to receive a launch title that would go down as one of its best games, the idea of a killer launch title is becoming a rarer occurrence in gaming. Still, launch games have more than left their mark on the industry. Here are, in my opinion, the 10 most significant video games to have launched their console. There is no foe in all of gaming as persistent as Bowser. 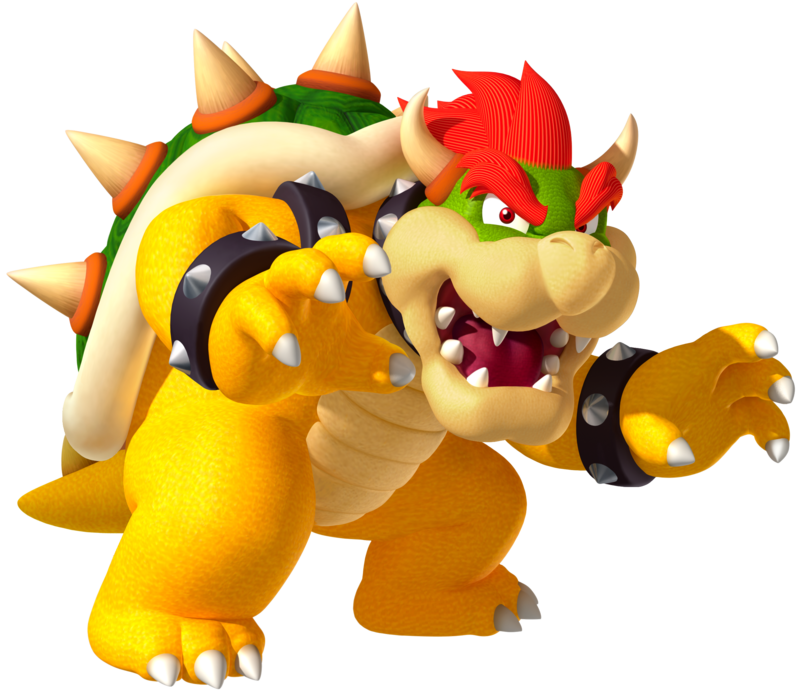 Since his debut in 1985, the King Koopa has dedicated his life to defeating Mario, kidnapping Princess Peach, and causing all around mayhem in the Mushroom Kingdom. Though Mario has bested him countless times over the past 30 years, Bowser just keeps bouncing back. But with so many memorable encounters against the King Koopa, which ones stand out as the best? The following is my list of the top 10 battles against Bowser from the Mario series. Keep in mind that I’m just sticking with the Bowser fights from the primary platformers in the series. So even though that final battle in Paper Mario was pretty awesome, it won’t be here. Also note that this isn’t a list of “hardest” Bowser battles. Too often these days do gamers simply think a difficult boss automatically equates to good and an easy boss is automatically bad. This list is based on how creative the boss fights were, the tension they create, and how definitive they are for their respective games. Difficulty is a secondary thing here. When Super Mario 64 was released all the way back in 1996 as the Nintendo 64’s key launch title, it was something of a miracle. For years developers had tried to make the idea of 3D gaming a reality, only for it to blow up in their faces. Then along came Mario, in full 3D, to show the world how it was done. Super Mario 64’s influence is hard to understate. Its design was such a creative and technical leap that it set the stage for just about every game that was to follow. The landscape of gaming was forever changed due to Mario’s debut outing in 3D. 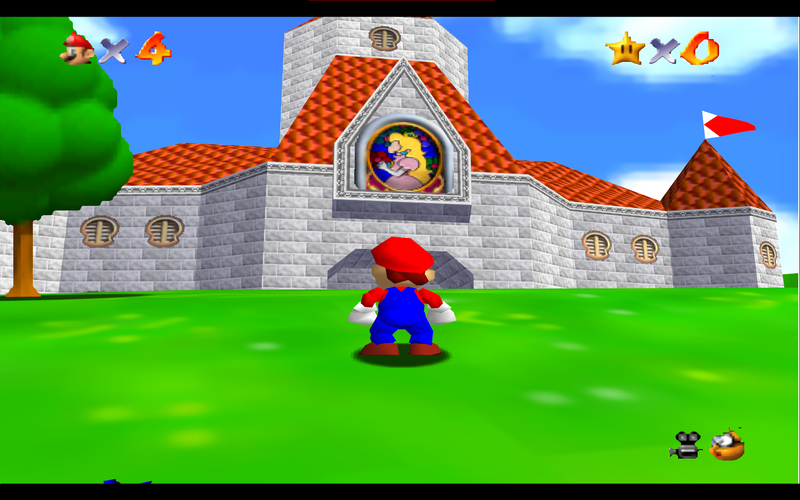 What makes Super Mario 64 truly remarkable is how well it holds up. The N64 and Playstation generation is not one that has aged particularly well – with only a few handfuls of titles being as fun today as they are in memory – but Super Mario 64, the earliest of Nintendo 64 titles, is still one of the most fun and ingeniously designed games ever. The plot remains unchanged from Mario’s past adventures. Bowser, that most perennial of video game baddies, has seized control of the Mushroom Kingdom and kidnapped Princess Peach. The twist here being that Bowser has trapped the Princess in her own castle with the magic of the Power Stars, which he then hid in various worlds that exist within the castle’s paintings. Mario must traverse the castle, enter these paintings, and uncover the Power Stars to progress further through the game. The Stars are the goal of each stage’s missions. Enter a stage the first time and you may have to wrest a Star from a boss encounter. The next time you may simply have to reach the end of an obstacle course. Mario partakes in footraces with Koopa Troopas, returns baby penguins to their mothers, and combs every stage for elusive red coins, to name just a few of the methods of earning a Power Star. It’s a nearly flawless setup that remained the standard of platformers for years. The levels are a marvel of design, and include Mario’s standard fire, ice and water worlds, as well as more obscure locations like the inside of a giant clock, or an island that is both tiny and huge. These stages are stringed together through Peach’s Castle, which remains the single greatest hub world in gaming. Its outer gardens are a place of heaven-like serenity, while its inner design is so charming you would never guess that it’s currently occupied by the game’s villain. The level design of Super Mario 64 is still breathtaking to this day, with every stage, even those with repeated gimmicks, having an identity of their own. It would all be for naught though, if Mario didn’t play so wonderfully. The Mario of 64 controls fluidly, and his actions are so precise that it’s a wonder how Nintendo managed to pull it off with their first try into this uncharted territory. Push the control stick gently and Mario tiptoes quietly enough to prevent a sleeping Piranha Plant from waking. Put some extra force into it and Mario sprints with wild abandon. Hit the action button once and Mario throws a quick punch. Hit it multiple times and Mario pulls off a combo straight out of a beat-em-up. And of course, there’s jumping. 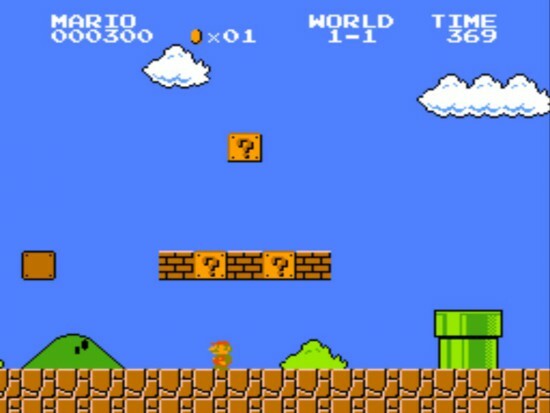 For the first time ever, Mario could somersault, backflip, triple jump, and leap off walls. Simple combinations of button presses and joystick motions perform these jumps, which added a whole new depth to Mario’s repertoire. Mario has so many moves at his disposal in Super Mario 64, but Nintendo pulled it off with such finesse that the game is every bit as accessible as its 2D predecessors. The game makes brilliant usage of its (then) newfound space. Wide open worlds give Mario plenty of room to perform his new acrobatics, and enemies and obstacles are presented in such ways to leave players to test every last one of Mario’s moves. 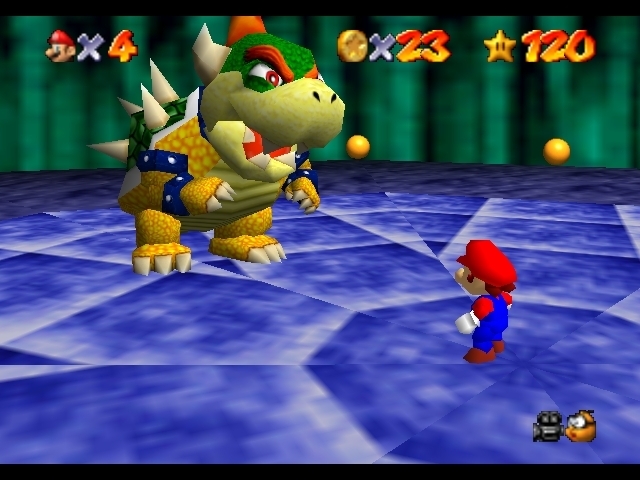 The fights against Bowser (of which there are three, which has remained something of the standard for the King Koopa ever since) are probably the greatest showcase of Super Mario 64’s understanding of 3D space. Run behind Bowser, grab him by the tail, swing him around and throw him into one of the bombs placed around a 360-degree battlefield. 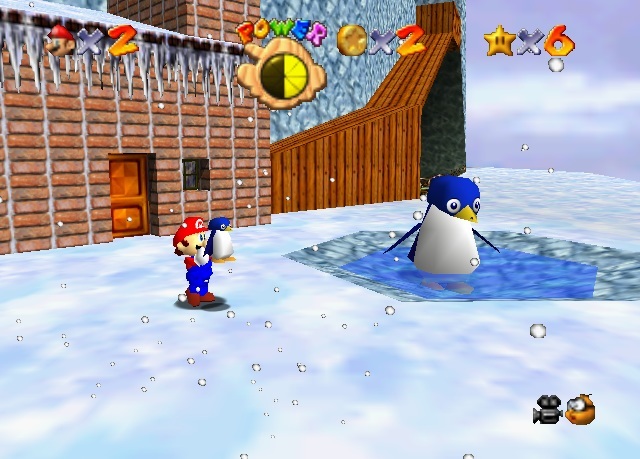 So much of Super Mario 64 was testing new waters, yet Nintendo crafted it with such playfulness and creativity that it never feels like a mere showcase of hardware. 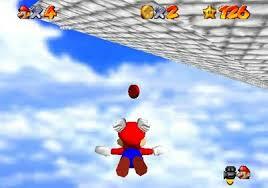 Super Mario 64 is a virtual playground. Mario’s list of power-ups was unfortunately shortened in the jump to 3D. 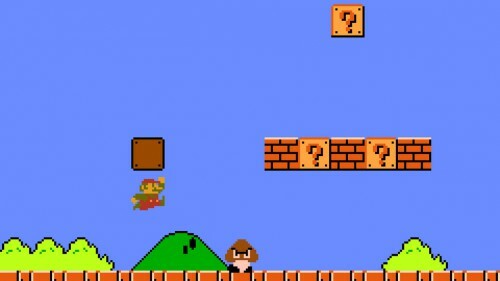 Gone are the Fire Flowers, Tanooki Suits and Super Capes of Super Mario Bros. 3 and World. In their place are three caps. 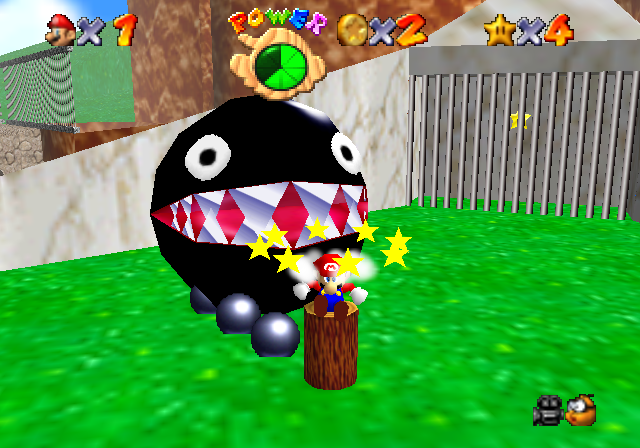 The Winged Cap is Mario 64’s premiere power-up, and grants Mario the ability of flight. The Vanish Cap makes Mario ethereal, allowing him to walk through walls. Finally, the Metal Cap turns Mario into an invincible, metal form, which can run through enemies with ease and sink to the bottom of water. The three caps are a fun twist on Mario’s power-ups, though they’re maybe a tad underutilized, which stings all the more knowing that none of them have ever made a return appearance in the series. The Vanish Cap in particular seems like a missed opportunity, as it only shows up a small handful of times during the entirety of Mario 64. Sadly, there is one aspect of Super Mario 64 that doesn’t hold up so well as the rest of it’s exquisite design: The camera. Even back in its day, some cried foul at Mario 64’s inconsistent fixed camera. Players have the ability to alter the camera angles themselves, but it only helps so much. Super Mario 64’s camera never feels broken, but you may find that, playing the game today, the camera will lead to more misplaced jumps and accidental plunges into the abyss than you’d like. It’s not too big of a complaint, however, when you consider that this was Nintendo’s first attempt at 3D gaming, and that they were so wildly successful in so many areas. The visuals are obviously dated, but the color and personality of the characters and environments make you not really care about how blocky Mario may look. The music, while maybe not as catchy as Mario World, is nonetheless memorable (the theme music for the water stages is still one of the most beautiful pieces in the series). But it’s the design, the genius structure of it all and the beauty of its execution, that makes Super Mario 64 such an enduring classic. The thrilling level design and the polished gameplay still hold up after all these years. Best of all are the little things, the throwaway details that display such creativity that most of today’s games wouldn’t even think to dream them up: The title screen which allows you to stretch and pull Mario’s face, which solely exists because it’s fun. The portrait of Peach that melts into Bowser’s ugly mug just before Mario falls through a trap door. The owl hiding in a tree, waiting to carry Mario into the clouds. The rippling walls that reveal themselves as entrances to secret worlds. And my personal favorite, the way the clock world goes into hyperspeed or a dead stop if the clock hands are in the proper positions when Mario enters its portal. 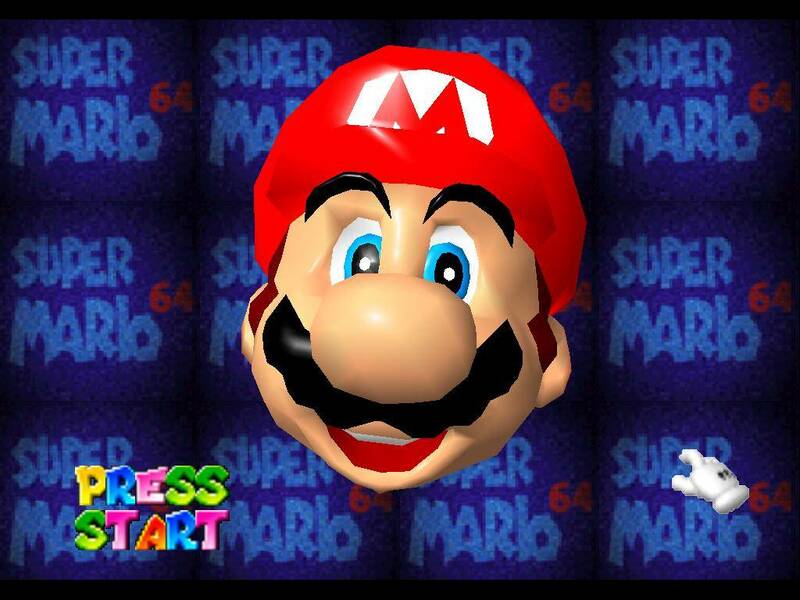 Super Mario 64 is brimming with ideas both big and small. 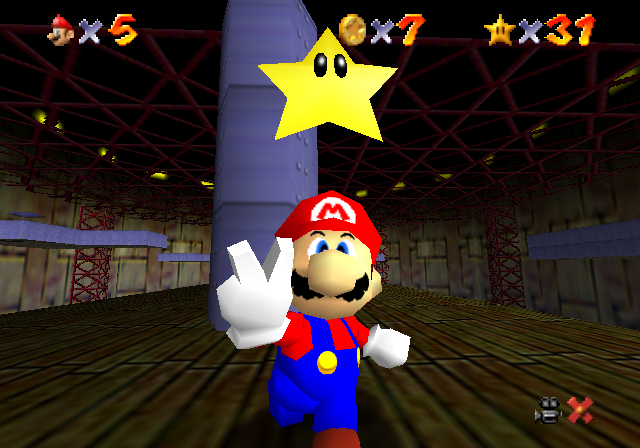 Super Mario 64 was a revolution in 1996, and it remains influential even today. But the greatest testament to its quality is how much fun it still is. The gameplay is still so entertaining, and the ideas still delight. The camera may prove troublesome to today’s gamers, and you may wish Metal Mario made a few more appearances, but make no mistake about it, Super Mario 64 is still one of gaming’s wonderlands.